"Awaiting Winter" Location: Pebble Beach, Pescadero, San Mateo County, California. Sometimes its just the crispness of the air and the warmth in the sunset that make the image. I almost let go of this image before my wife convinced me otherwise. It was the simplicity of the shot with nice light on the rock and open view of the pacific that I also liked and were probably the reasons why I shot this image in the first place. This image also an anticipation of winter months when the light is at its best here in California. Tech Info: Lens: 17-40f/4L at 20mm Camera: Canon EOS 5D Mk II Exposure: 1/3sec at f/14 and ISO 50 Filters: LEE ND Grads 0.9 soft edge and 0.75 hard edge stacked together The coastline of the Bean Hollow State Beach has one of the most unique rock formations. It is always a joy to visit this location and photograph it during sunset. There are no long sandy beaches to be found here but only the rugged stone formations eroded in strange and sometimes beautiful formations called "tafoni". I have been visiting here for many years and though I am somewhat satisfied with the images I have captured, I feel that the beauty of this place is best seen in person. These are twin beaches, Bean Hollow State Beach and the Pebble Beach. Both beaches are amazing with their rock formations, colorful pebbles, tide pools, tafoni and of course the open views of the pacific ocean. "Tafoni Formation" Location: Pebble Beach, San Mateo County, California. 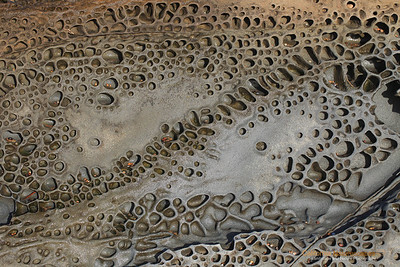 Tafoni is an interesting erosion pattern found on many rocks along the coastline of San Francisco bay area. Pebble beach, in particular, is one of the best local spots to see it. I visit this beach often, but the visit is even more engaging when the lighting conditions are great. A storm system moving over Bay Area produced some spectacular lighting conditions and I took that opportunity to capture this image. Tech Info: Lens: Canon EF 17-40mm f/4L @ 19mm Camera: Canon EOS 5D Mk II Exposure: 1/5sec at f/14 and ISO 200 Filters: Lee ND Grads 0.75 hard edge and 0.9 soft edge Post Processing: Lens distorition correction, spot removal etc., done in Adobe Lightroom and Adobe PhotoShop CS4 The coastline of the Bean Hollow State Beach has one of the most unique rock formations. It is always a joy to visit this location and photograph it during sunset. There are no long sandy beaches to be found here but only the rugged stone formations eroded in strange and sometimes beautiful formations called "tafoni". I have been visiting here for many years and though I am somewhat satisfied with the images I have captured, I feel that the beauty of this place is best seen in person. These are twin beaches, Bean Hollow State Beach and the Pebble Beach. Both beaches are amazing with their rock formations, colorful pebbles, tide pools, tafoni and of course the open views of the pacific ocean. 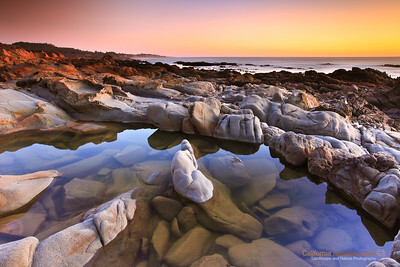 "I See Light" Location: Pebble Beach, Pescadero, San Mateo County, California. 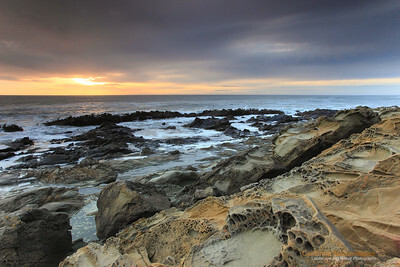 The eroded rock formations at the Pebble Beach never cease to inspire a photographic attempt. The unique honeycomb eroded pattern on the rock is called "tafoni" and must be seen in person to truly appreciate its beauty. I liked how things came together in this image. The break in the clouds allowed rock to receive nice light, clouds gave interesting backdrop to the sky and waves were just fantastic. I consider this image one of my lucky images especially since I have been here multiple times and tried photographing the very same spot. Tech Info: Lens: Canon EF 17-40 f/4L at 17mm Camera: Canon 5D Mk II Exposure: 1/2 sec at f/13 and ISO 100 Filters: LEE ND Grads 0.9 Soft Edge and 0.75 Hard Edge stacked together. The coastline of the Bean Hollow State Beach has one of the most unique rock formations. It is always a joy to visit this location and photograph it during sunset. There are no long sandy beaches to be found here but only the rugged stone formations eroded in strange and sometimes beautiful formations called "tafoni". I have been visiting here for many years and though I am somewhat satisfied with the images I have captured, I feel that the beauty of this place is best seen in person. These are twin beaches, Bean Hollow State Beach and the Pebble Beach. Both beaches are amazing with their rock formations, colorful pebbles, tide pools, tafoni and of course the open views of the pacific ocean. 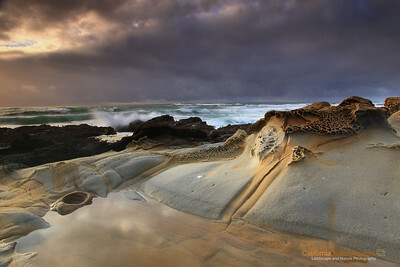 "Tafoni Formations" Location: Pebble Beach, San Mateo County, California. These are unique erosion patterns calles Tafoni. Pebble beach is one of the locations where these strange erosion patterns can be seen up close. Tech Info: Lens: Canon EF 100mm f/2.8L IS Macro Camera: Canon EOS 5D Mk II Exposure: 1/20sec at f/11 and ISO 50 The coastline of the Bean Hollow State Beach has one of the most unique rock formations. It is always a joy to visit this location and photograph it during sunset. There are no long sandy beaches to be found here but only the rugged stone formations eroded in strange and sometimes beautiful formations called "tafoni". I have been visiting here for many years and though I am somewhat satisfied with the images I have captured, I feel that the beauty of this place is best seen in person. These are twin beaches, Bean Hollow State Beach and the Pebble Beach. Both beaches are amazing with their rock formations, colorful pebbles, tide pools, tafoni and of course the open views of the pacific ocean. 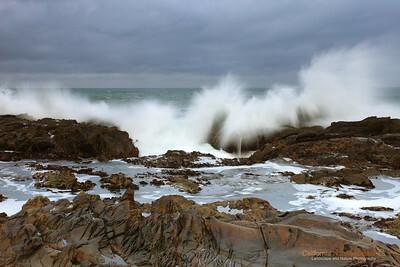 "Wave Splash" Location: Pebble Beach, San Mateo County, California. Winter weather is the best time to watch some wave action and rocky ledge like this one provides some really nice views. The waves crash with a spectacular display that cannot be given justice through a photograph. Tech Info: Lens: Canon EF 17-40mm f/4L @ 40mm Camera: Canon EOS 5D Mk II Exposure: 1/3sec at f/9.0 and ISO 50 Filters: LEE 0.9 soft ND grad The coastline of the Bean Hollow State Beach has one of the most unique rock formations. It is always a joy to visit this location and photograph it during sunset. There are no long sandy beaches to be found here but only the rugged stone formations eroded in strange and sometimes beautiful formations called "tafoni". I have been visiting here for many years and though I am somewhat satisfied with the images I have captured, I feel that the beauty of this place is best seen in person. These are twin beaches, Bean Hollow State Beach and the Pebble Beach. Both beaches are amazing with their rock formations, colorful pebbles, tide pools, tafoni and of course the open views of the pacific ocean. 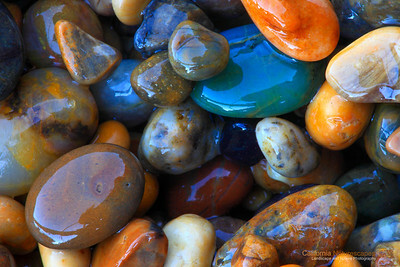 "Colorful Pebbles" Location: Pebble Beach, San Mateo, California. 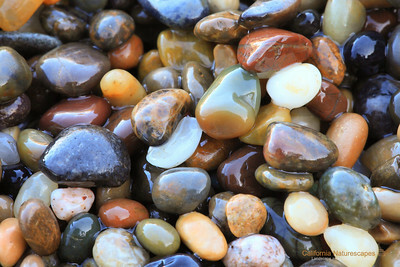 [GPS/Map] Pebble Beach is fascinating for it's interesting rock formation, but people often fail to notice the little colorful pebbles after which the beach is aptly named. I used a macro lens to zoom onto these little gems. It's too bad you are not allowed to bring these home. Tech Info: Lens: Canon EF 100mm f/2.8 L IS Macro Camera: Canon 5D Mk II Exposure: 8sec at f/29 and ISO 320 Filters: B+W Circular Polarizer to extentuate the colors and minimize water reflection The coastline of the Bean Hollow State Beach has one of the most unique rock formations. It is always a joy to visit this location and photograph it during sunset. There are no long sandy beaches to be found here but only the rugged stone formations eroded in strange and sometimes beautiful formations called "tafoni". I have been visiting here for many years and though I am somewhat satisfied with the images I have captured, I feel that the beauty of this place is best seen in person. These are twin beaches, Bean Hollow State Beach and the Pebble Beach. Both beaches are amazing with their rock formations, colorful pebbles, tide pools, tafoni and of course the open views of the pacific ocean. 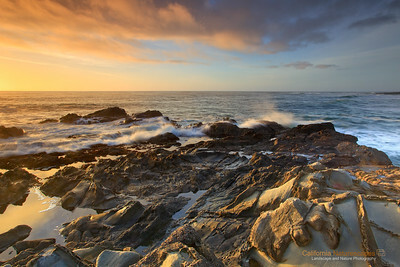 "I See Light" Location: Pebble Beach, Pescadero, San Mateo County, California. The eroded rock formations at the Pebble Beach never cease to inspire a photographic attempt. The unique honeycomb eroded pattern on the rock is called "tafoni" and must be seen in person to truly appreciate its beauty. I liked how things came together in this image. The break in the clouds allowed rock to receive nice light, clouds gave interesting backdrop to the sky and waves were just fantastic. I consider this image one of my lucky images especially since I have been here multiple times and tried photographing the very same spot. Tech Info: Lens: Canon EF 17-40 f/4L at 17mm Camera: Canon 5D Mk II Exposure: 1/2 sec at f/13 and ISO 100 Filters: LEE ND Grads 0.9 Soft Edge and 0.75 Hard Edge stacked together.